Can I Buy an E-Cigarette in Stores? A while back, the Associated Press estimated that as many as 2.5 million Americans have switched from tobacco cigarettes to e-cigarettes. So far, e-cigarettes have largely been an online phenomenon; vendors primarily sell them online and give affiliates small commissions to help spread the word. However, for e-smoking to become truly mainstream, it needs to be possible to buy an e-cigarette in stores — and that’s starting to happen. 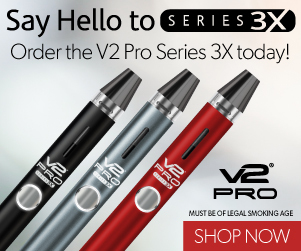 My favorite e-cigarette company — V2 Cigs — is working on increasing their presence in brick and mortar stores, so it’s likely that you’ll be able to buy their e-cigarettes locally in the near future. VaporFi isn’t the only brand getting in on the action, though. Since Big Tobacco is now selling e-cigarettes, you’re likely to find the e-cigarette in stores a lot more frequently in the near future. Article updated in 2014: E-cigarettes are now available in more local stores than ever! I’ve updated this article with some of the industry’s latest happenings. It is important to note that while you can buy an e-cigarette in stores, it doesn’t necessarily mean that you should. The e-cigarette brands that you most commonly see in stores — brands such as Blu and NJOY — aren’t exactly known for providing a great deal of value for the money. Blu’s Premium starter kit costs $79.95, and refills for the kit cost $12.00 per five-pack. NJOY’s kit costs $71.99, with refills costing $21.99 for five-pack. You can get an e-cigarette for significantly less than this from other companies, and get a higher-quality product to boot. Although there’s certainly nothing wrong with grabbing a cheap disposable e-cigarette from the local convenience store so you can get an idea of what e-cigarettes are like, you should understand that you’re only getting a small part of what e-cigarettes have to offer. Learn more in my article about the best e-cigarette for beginners. Vaping Guides reported in April 2012 that Walmart has begun to carry the NJOY e-cigarette in stores. Walmart isn’t carrying the $71.99 premium kit. Rather, they’re carrying the Express Kit, which includes one battery, a USB charger and a refill cartridge for $21.99. Refills cost $18.97 per five-pack — a little less than what NJOY charges online but still significantly more than what you’d pay if you purchased an e-cigarette from another merchant. 2014 update: It appears that some or all Walmart stores now carry the Mistic e-cigarette brand, with prices starting at $6.00. Walgreens carries the Blu e-cigarette in stores. Walgreens sells Blu disposable e-cigarettes at $7.99 each, and although I’m unable to find pricing information, they carry starter kits as well. While the Blu disposable may be a good way to try e-cigarettes if you aren’t sure whether to invest in a full starter kit, you wouldn’t want to use disposables long-term as they provide no real cost savings compared to tobacco cigarettes. When you’re ready to switch to e-smoking full-time, the Blu starter kit isn’t one I’d suggest. CVS and Long’s Drugs began carrying the NJOY e-cigarette in stores in 2009, and as of 2011 you could still find NJOY kits on CVS shelves in the smoking cessation area. All references to e-cigarettes have since been removed from the CVS website and I haven’t been to a CVS or Long’s Drugs recently to see if e-cigarettes are still available. Because the FDA frowns on advertising e-cigarettes as smoking cessation devices, it’s possible that CVS has stopped selling them. 2014 update: CVS no longer sells e-cigarettes. Evidently, they are waiting for the FDA to issue its proposed e-cigarette regulations and will be phasing out tobacco sales in all stores by October. Reportedly, some 7-Eleven stores are now carrying the XHale O2 electronic cigarette. Although the price is quite reasonable, it sadly uses e-cigarette cartridges rather than cartomizers and therefore most likely has pretty poor performance. The kit costs $14.99 and includes a battery, a USB charger, an atomizer, four disposable cartridges and a carrying case. Refill cartridges cost $15 per ten-pack, which is quite expensive; back when disposable cartridges were still common, you could get them for as little as $4 per ten-pack. Most stores that carry e-cigarettes sell cartomizer-based models because they work so much better. 2014 update: NJOY and NEwhere e-cigarettes have now been spotted at 7-Eleven stores. According to a press release, Blu began selling its products at Meijer locations in the Midwest in 2011. Although the press release mentions the Blu disposable e-cigarette, it doesn’t say whether full starter kits and refill cartomizers are also available. Meijer customers can buy the Blu e-cigarette in stores around Michigan, Ohio, Indiana, Illinois and Kentucky. In the same press release mentioned above, Blu mentioned that its products would become available in 329 H-E-B locations in Texas and Mexico. According to a 2012 article in Drug Store News, Rite Aid had begun to carry e-cigarettes from the Vapor Corp distributor. Vapor Corp’s brands include Krave, Fifty-One, Trio, GreenPuffer and VaporX. However, Vapor Corp was also involved in a lawsuit with Dragonite/Ruyan in 2012 and I’m unable to find a great deal of information about the current status of the company. Information found elsewhere in 2014 suggests that some Rite Aid locations carry Mistic e-cigarettes and that other stores may carry different brands depending on the needs of the local market. Pat, a reader, wrote in to let me know that Blu starter kits and disposables have been sighted at certain Shell gas stations. Since Shell isn’t one of the retailers prominently featured on the Blu website, I’m unable to tell currently whether this is widespread or just at the Shell station(s) in Pat’s local area. In 2012, an E-Cigarette Forum member reported seeing the Metro e-cigarette brand in his local Kroger store. I am unable to find any official information from Kroger stating that Metro or other e-cigarettes are available in its stores nationwide. As of 2014, I have found no information indicating that e-cigarettes are available in Kmart stores. In 2012, a company called All Smoke Free sold e-cigarettes at the Piggly Wiggly location in Dora, Alabama. I’m unable to determine whether this company is still in operation or if e-cigarettes are sold at other Piggly Wiggly locations. As of 2014, many Chevron stations carry Blu e-cigarettes. As of 2014, many Exxon stations carry Blu e-cigarettes. Have you found the e-cigarette in stores near you? Leave a comment or contact me to let me know what brand you found and how much it costs. Although I’ve focused on major chains here, don’t forget to check your local Mom and Pop convenience stores and tobacconists if you’re looking for a way to buy e-cigarettes locally. I think that smaller stores are likely to be far more receptive than chains regarding suggestions about the brands and products customers want. Do any Brooklyn NY stores carry JUUL electronic cig refills? You can find a store locator by clicking the link in my JUUL e-cigarette review. Thanks, Thomas! I’m glad that you found the article useful. Thank you, Christy! I did quite a lot of research to put this article together, and I’m glad that you found it helpful. Thanks, Ricky! I’m glad that you found the list useful. Long time smoker, cigars, currently, cigarettes and pipes in the past. I am interested in the V2, but don’t want to break the bank, trying it. Would the Express kit be the smartest first vape use for the money? The V2 Cigs Express Kit is a good way to get started with vaping, Carl. You could also try a disposable e-cigarette, but I usually don’t recommend disposables. The fact that you can’t recharge them means that they aren’t the greatest values compared to rechargeable e-cigarettes. My son got me a Vaporesso starter kit, (4 Christmas) he’d seen online. It was big, bulky and a badass! It also peed on me when it took a notion. I had to take a video before sending it back,and they were good about give’n him credit, but all the while I was back 2 smoking or trying 2 get satisfaction from ONNI refillable pens. I was getting desperate one evening and drove to town and checkout a local vapor shop and they were closed. Had 2 go to Walgreens and they had some ENJOY’s on sale. I picked up a hand clicker with a BLACKBERRY disposable tank, and I was hooked! The tanks juice went 2 fast and soon I had my Dremiel out making holes 2 refill em. For 10 bucks i’ll keep the base, (Battery) but need a refillable tank that will LAST! What would be a good choice that I can get locally? Kinney Drugs throughout Vermont are carrying V2 products, to include cartridges, now.